Over the years the Academy has built a network of parnters in 28 countries around the world. Agencies, schools, embassies, collaborate with the Academy for professional training in Italian cuisine. Accademia graduate students work anywhere in the world, such as chefs, pizza makers, cooks or confectioners. If you have a company, or if you represent an institution, and you want to send students to our courses, you can become one of our partners. 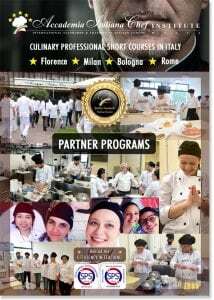 You can offer professional cooking training in Italy. You can choose a date and a program customized for your groups. You can request to take professional courses in your country. The Academy has a series of collaboration programs designed for any type of companyes. Institutions or Outbound and Inbound operators who want to offer their clients professional cooking courses in Italy can complete the form. You will receive by email our Partners Program with all details.